Eurasian: Mixed Identities in the United States, China and Hong Kong, 1842-1943. Berkeley: University of California Press, 2013. 352 pp. In 1875, Yung Wing, the first Chinese student to graduate from a U.S. university, married Mary Louise Kellogg, the daughter of a prominent New England family, in a suburb of Hartford, Connecticut. The interracial union drew attention on both sides of the Pacific. Joseph Twichell, who attended the wedding as Yung Wing’s pastor and friend, wrote in his diary: “The match was a good deal commented on. Some people feel doubtful about it; some disapproved it utterly; some (like me) gloried in it” (32). 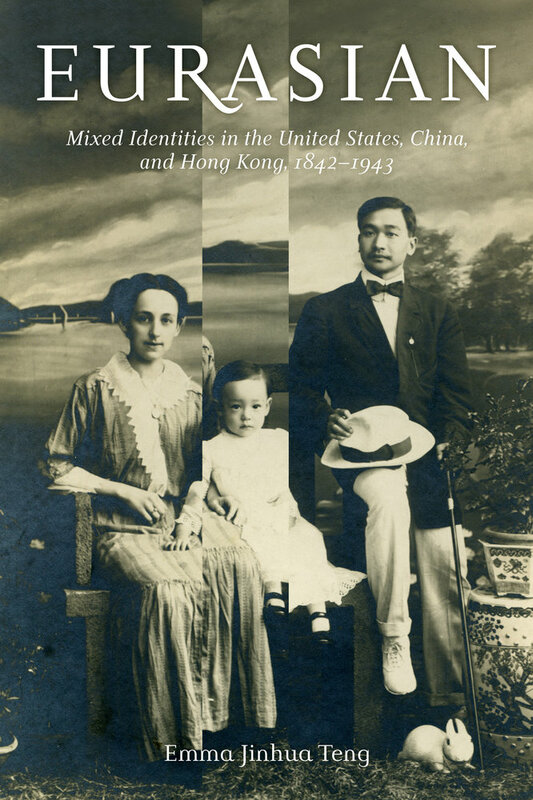 Emma Jinhua Teng’s Eurasian: Mixed Identities in the United States, China and Hong Kong, 1842-1943 tells the largely unknown (and sometimes purposefully hidden) history of mixed race Eurasian families between 1842 and 1943. Eurasian is primarily a work of cultural history that seeks to “examine the ideas concerning racial and cultural intermixing that shaped Eurasian lived experiences” (2). Though she uses the term “Eurasian,” Teng does not focus on European-Chinese mixing; instead, she centers her study on the mixed race people produced by U.S. imperialism in China and Chinese migration to the United States. Teng identifies three primary cohorts of Eurasians during this period: children born to Chinese mothers and U.S. merchants or sailors living in China; children of U.S. missionaries in China who married Chinese Christian converts; and children of Chinese migrants in the United States and American women (6). The monograph is divided into three sections: Parts I and II consider debates over the meaning of intermarriage and hybridity. In the final section, Part III, Teng turns to Eurasians themselves and how they claimed racial and national identities. In an impressive feat of transnational and bilingual research, Teng locates the history of Eurasians in the United States, China, and Hong Kong. She reconsiders some of the better-known Eurasians, like Sui Sin Far and George Appo, but also recovers many additional stories. Teng seeks to complicate scholarly assumptions that all Americans and Chinese, as Twichell wrote in his diary, “disapproved [of racial mixing] utterly.” As Teng adeptly demonstrates, there were also Chinese and Americans who “gloried in” interracial intimacy. Teng focuses on paradoxical themes in Eurasian identity: she uncovers contemporaneous discourses of hybrid degeneracy and hybrid vigor, and she exposes uneven Eurasian experiences of prejudice and privilege. Teng’s narratives of hybrid degeneracy and prejudice will be more familiar to scholars. Anti-Chinese agitators in nineteenth century America used the specter of racial mixing to further their calls for exclusion. They marshaled the racial science of the day to argue that miscegenation could cause “the downfall of American civilization” by producing offspring inferior to both the Anglo-Saxon and Chinese races (96). By 1935, fifteen states had passed anti-miscegenation laws that specifically targeted marriages between Chinese and whites. In addition, American women were subject to “marital expatriation,” or being stripped of their U.S. citizenship when they married an alien. In addition to losing their nationality, American wives of Chinese men could also lose their racial status. Census enumerators sometimes labeled such women “Chinese” in their records. In Hong Kong, Eurasians faced prejudice from both Europeans and Chinese because of the “impurity” of their foreign blood and the stigma of assumed illegitimacy (199). Teng, however, emphasizes a contrasting discourse of “hybrid vigor” and experience of privilege. Among racial scientists, there was near consensus that racial mixing was catastrophic, but Teng uncovers a minority viewpoint that argued for “constructive miscegenation” (96). Some Protestant missionaries, focused on converting Chinese on both sides of the Pacific, saw intermarriage as a “vehicle for assimilation” (39). Teng argues that some U.S. elites, who were regular consumers of Chinese luxury goods, also celebrated (or at least accepted) intermarriage between upper-class Chinese men and American women. In addition, Teng argues that some Eurasians experienced “a certain degree of privilege” which could “mitigate” some of the prejudice they faced. In Hong Kong, for example, some elite Eurasians described being able to “choose sides” to their best advantage and others “enjoyed a degree of colonial privilege” (201, 226). In chapter 4, Teng offers a fascinating comparison between Chinese and western racial thinking in the late nineteenth century. These two intellectual discourses were connected and yet distinct. Chinese intellectuals drew from western scientific racial theories, especially Social Darwinism and the concept of an international contest for survival of the fittest. Influenced by these theories and the threat of western imperialism, Chinese intellectuals constructed a new racial formation, the “Hanzu” or Han lineage (115). Some Chinese intellectuals emphasized the purity of the Hanzu and the problems of racial mixing, but others promoted ideas of hybrid vigor. Kang Youwei, the Confucian philosopher, imagined the unification and improvement of the human race through miscegenation. Similarly, Tang Caichang argued that the “weaker” Asiatic race could be improved by the infusion of strong European blood (123). Though these Chinese intellectuals borrowed elements from western racial science, they came to radically different conclusions about the significance of Eurasians. Most of Eurasian is devoted to analyzing discourses about Eurasian families and individuals but, in her final section, Teng turns to the way Eurasians have narrated their own experiences. She examines a few individual Eurasians to expose the range of self-representation they found possible within their social environment. Some Eurasians sough to “pass” as white, others purposefully claimed Chinese identity, and a few sought a distinct Eurasian identity. For the latter group, Teng profiles Carl G. Anderson, who in 1929 sought to mobilize Eurasians in Hong Kong to establish a Eurasian charitable organization. Anderson argued that despite Eurasian diversity—the “gulf between a Chan and a Smith amongst us”—the small community should recognize its shared blood and cultural heritage. Eurasians themselves, Anderson believed, bore the burden of proving to their detractors that they were the “positive fusion” of the West and East (231). Teng ends her book with a reflection on contemporary politics of assimilation. Today, Chinese Americans vigorously claim the right to be American and yet assume that Euro-Americans could never truly become Chinese. “Multiculturalism,” Teng observes, “is not a two-way street.” Teng encourages her readers to “shift our focus away from ‘biological’ notions of Chineseness defined by racial descent and consider the possibilities of Chinese-ness (like Americanness) as a matter of consent” (261). This final provocative point could have been better integrated into the larger project. Though Teng seeks to explore and complicate our understanding of Eurasian identity, she choses her subjects using the essentialist criteria of blood. Teng defines a Eurasian family as Chinese and white sexual partners and defines Eurasians as the product of this mixing. The book could have benefited from further interrogation of the category “Eurasian,” especially since “Eurasian” was not a self-conscious identity or community during much of the period Teng explores. Does “Eurasian” only refer to descent, or is it also a matter ofconsent? Meticulously researched and artfully narrated, Emma Jinhua Teng’s Eurasian: Mixed Identities in the United States, China and Hong Kong, 1842-1943 introduces readers to a little-known history of interracial intimacy and hybridity. The book provides an excellent balance of analytical intervention and intriguing personal narratives, which will make it appealing to both scholars and undergraduates.